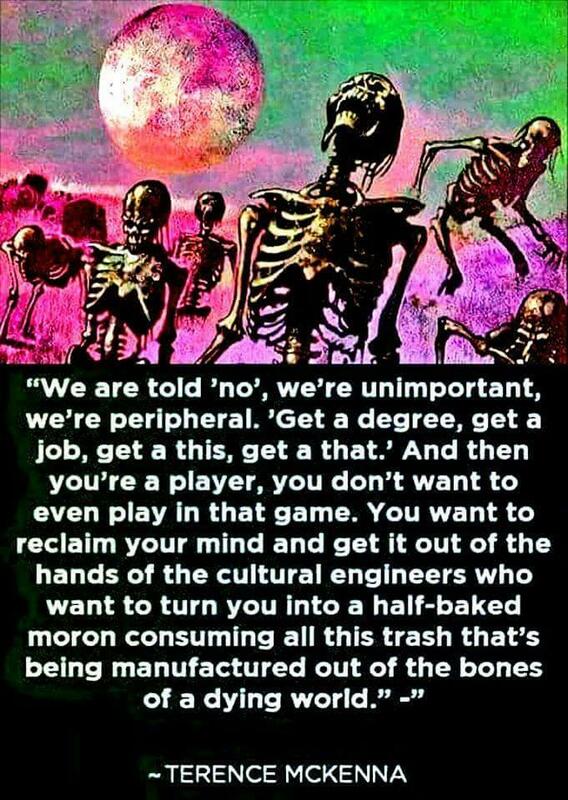 Never mind the skeletons added for dramatic effect, this little snippet below from Terence McKenna is pretty insightful. Just reading this little quote makes me think of my own experience with life. When I was working a high stress office job, I definitely was spending a lot more money on crap I didn’t need just to try to relieve stress or find some happiness. Having retired and no longer work, my income has gone down, but I’m a hell lot happier. I also stopped buying crap I don’t need for the sake of making myself happier, which funnily enough also balances out with the lower income. More importantly, most of us really are fed a weird sort of message throughout school and our adult lives that manipulates us, intentionally or not, in a certain direction. We really are told that we are unimportant and unexceptional. The group, society or culture we belong to gets to be exceptional, and we get to be proud that we are a part of it; however as individuals, we are not. You can’t learn how to play music. That’s only for talented people who’s started doing it since the age of 7. You don’t get to become a millionaire or somehow retire in your 30s; people like that are rare, so be grateful for your soul crushing 8 to 6 job. You don’t get to learn about mysticism or explore your own mind or converse with spirits; this stuff is either hogwash or for super talented people who are one out of a million. Settle with being mediocre, be grateful for what little you already have, and be happy to suffer because it COULD be worse. Humility and acceptance of suffering are encouraged in our society partially because of this message of mediocrity. When you are convinced that you are inferior and incapable of achieving anything, the only source of happiness left is consumption – be it media such as the newest season of TV or consumer goods like the the newest released iGadget. Interestingly enough, having done most of the stuff I mentioned above, I can say that the message of mediocrity most of us are fed in our lives is the only piece of hogwash there is. You can learn music NOW – doesn’t matter if you’re already an adult, you just need to be able to devote an hour or more a day to practice. Give up some TV or video games and the time is right there. You can retire super early – learning about investment management and early retirement planning is a fine start at doing so. That whole mysticism, spiritual growth thing? Same with music, devote some time to it everyday, make it into a habit, and you’ll make progress. Most skills and achievements in life are not only a matter of having talent or doing something since a very young age (they certainly do help), they are mostly a matter of actually TRYING and devoting consistent time & effort on whatever it is you’re trying to accomplish. Whatever you want to do, go ahead, start doing it. So why are we fed the message of mediocrity so often in our lives? That’s a topic for a different day, I’ve rambled on long enough for this post as it is.